Not all homes are blessed with spacious kitchens. Some would merely have a small space where they can cook and prepare food. But if the kitchen is used by one person only most of the time, then a small kitchen isn’t a problem. Like a big kitchen, it can also have everything that one needs to prepare food. It is just a matter of design. It is important that enough storage spaces are added vertically to keep items in the kitchen in place. Also, despite being small, there should be enough space to move in the work area. That is why, it is best to keep an open layout for small homes. But does it mean that just because the kitchen is small, it will look boring and dull? Of course, not! You can always add life to your kitchen in so many ways. You can allocate an open shelf for displays. You can also put up some wall decors. Or you can even add colors for the backsplash and walls. 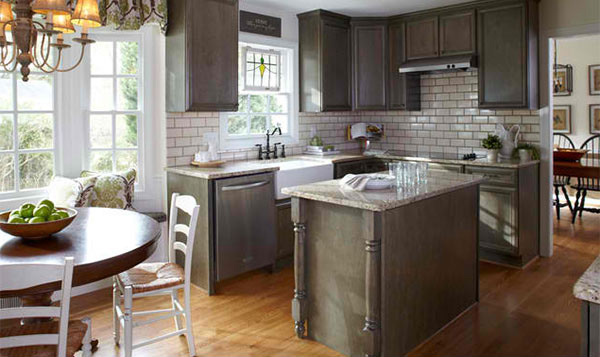 Speaking of walls, we are going to show you more ways to add verve to your kitchen walls. 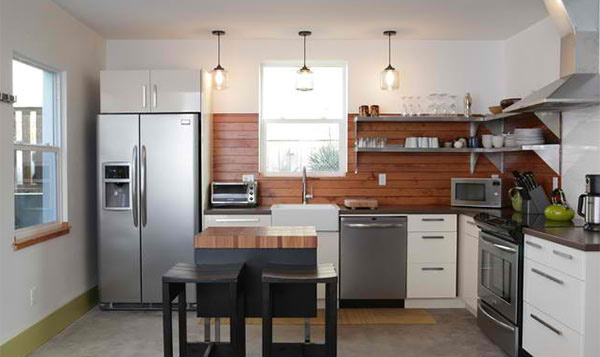 Learn how your small kitchen could look visually larger and even more appealing. 1. Paint it with bright colors. Pick a color that you love, or choose a color that will fit to your personality and use it to paint your kitchen’s wall. You can paint on just one part of the wall or the entire kitchen wall. This will help define the kitchen’s space and will also make it appear larger. Adding colors will draw the eyes to that area of your kitchen. You can use pale colors as well as it will reflect light and make the space feel bigger. But you can use deep tones too for it creates the impression that the walls are farther back. 2. Make it look more interesting with murals and wallpapers. You can bring in more personality to your kitchen by adding murals. You can have it painted or you can also grab murals that are made of ceramic tiles. There are also stickers too which are easy to stick and peel. Wallpapers can also be nice. Pick the design of your choice and it will make your small kitchen look lovely. Choose patterns that will direct the eye upward or those that will guide the gaze toward the ceiling. Of course, vertical lines will do that trick for the wall. But you can use other patterns as well, especially those that go up the wall. 4. Go up and look up for storage! Store vertically by using the walls. Hanging cabinets always work well. But if you have an empty wall, you can always use that too. Simply adding hooks to it will allow you to hang some kitchen stuffs. Or you can use a pegboard too. This way, you can use the walls to their full potentials. 5. Be glam with mosaic tiles. 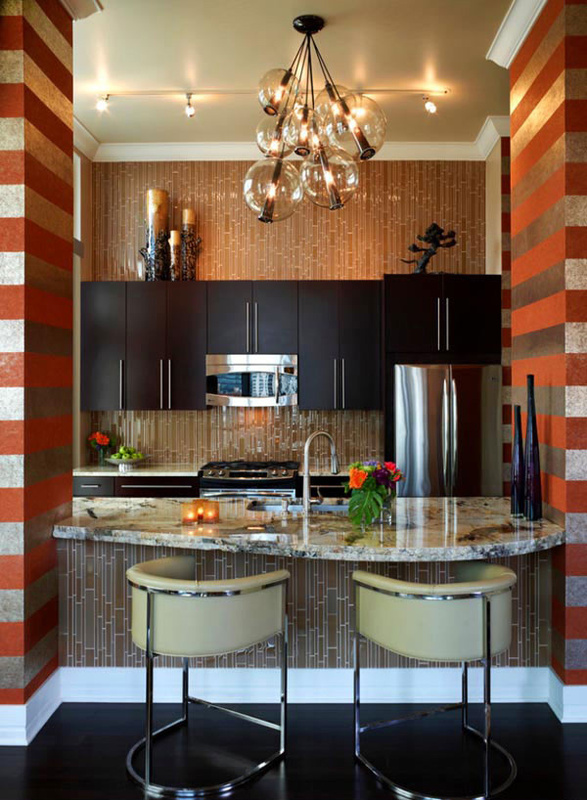 As always, mosaic tiles will make any space look sophisticated especially if you combine different colors together. You can use that for the kitchen too. But if you don’t want to use mosaic tiles, you can always cover the kitchen walls with ceramic wall tiles that have interesting colors and prints too. 6. Add an industrial feel with bricks. Want an urban industrial look? 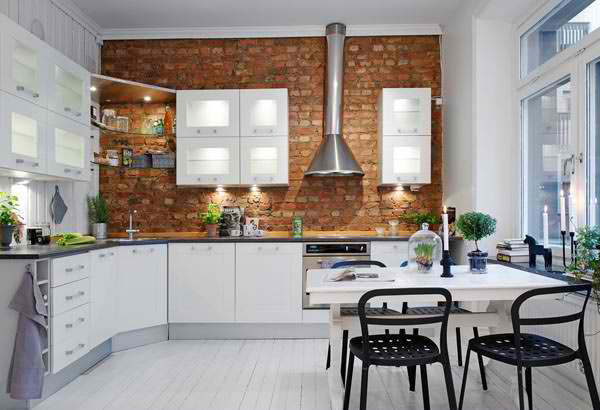 Why not add bricks to a wall in the kitchen? This would definitely look stunning! We have seen how brick walls have changed various spaces. It will do the same to your kitchen. 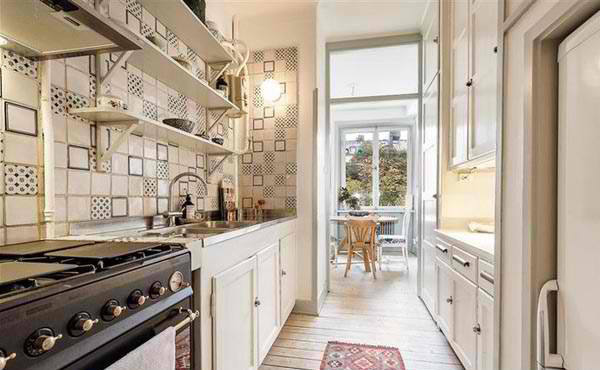 Even for a small kitchen, this will work well because it will draw one’s gaze to that part of the wall. 7. Subway wall tiles will never go out of style. Even with the modern trend these days, we can still see this being used in interiors. As a matter of fact, it is a hit in kitchen walls because of its clean look which adds more drama to the kitchen as it give it that classic appeal. 8. 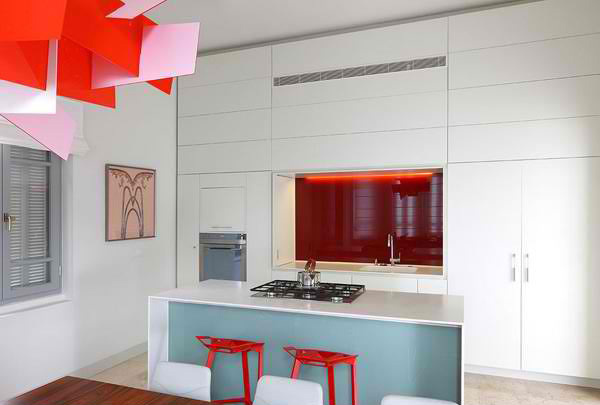 Use one color for walls and cabinetry. 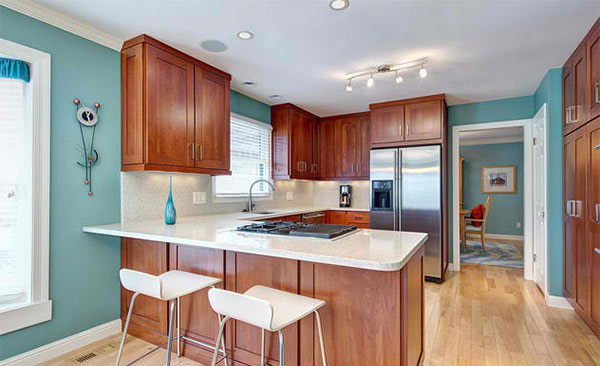 Once you limit the color of your wall and cabinets to one color, it erases visual boundaries that would stop the eye. If you want safer colors, stick to pale ones like white or beige. But don’t be afraid to use darker hues for it can also recede your space visually. 9. Wood pallets are great for a natural touch. Many kitchens have wooden walls. Some even use wooden pallets. This will be good even for a small kitchen because it adds a natural touch to it which would also lessen the formality of the space making it cozier and more inviting. 10. Just leave it white. You can keep your kitchen looking clean with white walls. 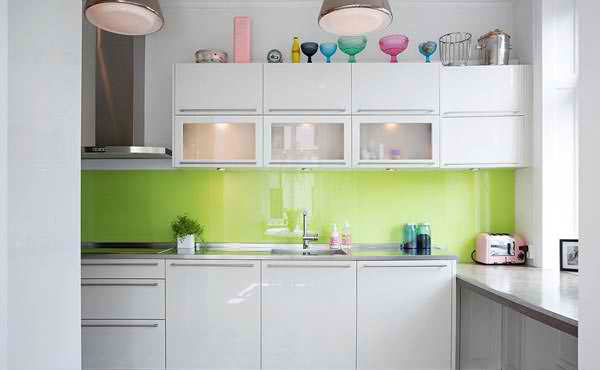 But you can add accent colors to the wall cabinets and other items in the kitchen. But others prefer to use white for everything in the kitchen. 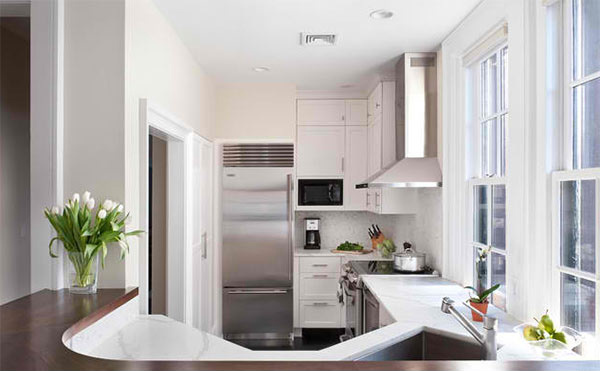 Nothing beats the sleek and streamlined look of a white kitchen especially if it has a modern design. This way, your kitchen will look even more spacious. See? It isn’t really hard to work on the walls of a small kitchen. Aside from those mentioned, you can always add some wall decors too. 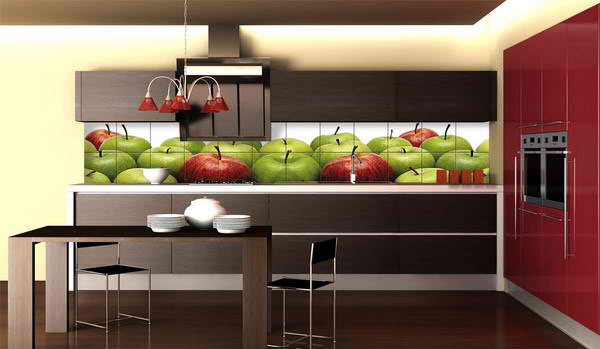 There are wall decors intended for the kitchen. Kitchen wall clocks can be a good idea as well as paintings. Once you did something amazing to your kitchen’s walls, you will liven up the space and you will love to spend even more time preparing food in the kitchen. And yes, we know that for food and cooking lovers, it will always be your favorite space in the house!